Modernity was born in the nursery of the Reformation. In fact, the Reformers gave birth to the scientific worldview of instrumental reason that produced radical pluralism, liberal democracy, skepticism, capitalism, and—most significantly of all—replaced the sacramental cosmos with a disenchanted universe devoid of God and meaning. This is a familiar interpretation of modernity over the last couple of centuries. The only question is whether the Reformation is to be praised or blamed for this allegedly pioneering role. 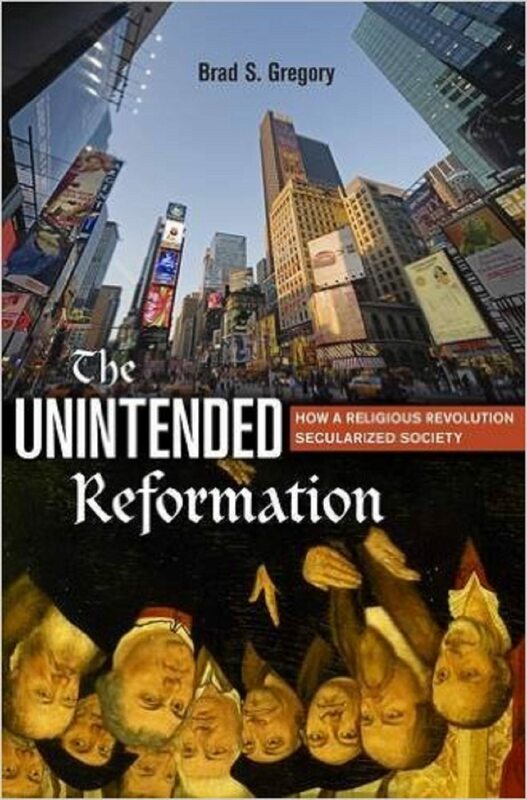 Notre Dame historian Brad Gregory follows the latter course, as the title of his book, The Unintended Reformation: How a Religious Revolution Secularized Society, suggests. He’s hardly alone. In fact, he adopts a slightly more nuanced line of Roman Catholic polemics since the Counter-Reformation. More to the point, he repeats what I call the Scotus Story with breathtaking expansiveness, though lacking the nuance of Henri de Lubac and Amos Funkenstein, or the philosophical depth of John Milbank’s Radical Orthodoxy circle of writers. Univocity—that is, the claim that being means the same thing for God as it does for humans. Thus, God becomes a being among other beings, or the whole of which all creaturely beings are a mere part. In either case, what’s lost is the traditional belief that human existence is merely analogical of God’s. When we say, therefore, that God “exists,” the scare quotes indicate a refusal to identify the Creator exactly with the creature at any point. One consequence of univocity is that divine and human agency become a zero-sum game: to the extent God is the efficient cause, creaturely causes are diminished. In an analogical account, however, God is never one actor among others. The principle of parsimony (or Ockham’s razor), which says the simplest explanation is to be preferred. In practice, this gradually allowed scientists to rule out divine involvement in nature to the extent phenomena could be explained simply enough by appeal to natural causes. A radical voluntarism that unhinges the will (both God’s and ours) from the intellect and therefore nature. God’s absolute power is so all-determining that the world he’s created may be radically different from—even contrary to—any natural design or goal traditional theology believed was inherent in nature. A rift begins to emerge between reason and revelation, God’s ordinary operations and extraordinary (even arbitrary) willing. This voluntarism extends to the creature, as humans are determined less by their nature (what they are inherently) than by their will (what they choose to become). The focus on particulars over universals. While Scotus at least believed universals existed in the mind, Ockham concluded they were merely useful terms or metaphors (hence, nominalism). We use these terms to lump together particular things with similar characteristics. Therefore, it’s not by examining natures (or universal forms) through deductive reasoning, but by examining things (or particulars) through observation-based induction, that we arrive at truth in natural philosophy. Henri de Lubac took the narrative further back to include the Gregorian reforms of the 11th century. More recently, Charles Taylor’s A Secular Age follows the Scotus Story while nevertheless including the history of Western reform movements to greatly enrich his narrative. In varying degrees, this thesis has dominated Roman Catholic and Anglo-Catholic interpretations of modernity including those of Etiènne Gilson, Louis Dupré, and John Milbank’s circle of Radical Orthodoxy. It has also appeared in the works of evangelical and Reformed writers such as Hans Boersma and Peter Leithart. Nevertheless, some of their departures from the traditional Christian view seem to have implied univocal metaphysical assumptions in ways that probably did contribute to an eventual conception of a disenchanted natural world. One such departure was their variegated rejection of sacramentality as it was understood in the Roman church, not only with respect to the church’s seven sacraments, but also as a comprehensive, biblical view of reality in which the transcendent God manifests himself in and through the natural, material world (41). Harvard University Press. 592 pages. $39.95. The problem, especially for a historical book, is that there’s no historical argument. The Scotus Story is just assumed, even though it’s been met with considerable counter-evidence for many decades now. Richard Cross, Marilyn McCord Adams, Alan Wolters, and other Scotus specialists aren’t even mentioned. When it comes to the Reformation, the Scotus Story is even more untenable. Hedging his bets with qualifiers like “some of their departures . . . seem to have implied univocal metaphysical assumptions in ways that probably did contribute to an eventual conception of a disenchanted natural world,” Gregory’s work turns out to be less a book on the Reformation than on his own idea of, as he puts it, “The World That We Have Lost.” There isn’t a single primary source (or even a reference to secondary specialists) to justify this central thesis of his book. Luther had some nominalist teachers, of course, but their maxim “God will not deny grace to those who do what lies within them” soured him on the school. Philosophically, Luther was more interested in the German mystics—the sort of Neoplatonism that defenders of the Scotus Story think “will save us now” (Milbank). Calvin was no philosopher, but on the relevant points he generally sided with Aquinas and referred to the Scotist idea of God’s “absolute power” as “a diabolical blasphemy invented in hell.” The Lutheran and Reformed scholastics were more universally committed to the traditional doctrine of analogy over univocity than were their Roman Catholic counterparts. At the end of the day, though, none of this matters for Gregory. Though assuming the Scotus Story, his real thesis is that the Reformation destroyed the consensus of Latin Christendom. By dividing the church and falling into various confessions, the Reformation proved that sola scriptura is a recipe for disaster. The other solas fare no better in Gregory’s account, although he attributes to the reformers views they explicitly rejected (such as the abolition of God’s image after the fall). Interpreting sola scriptura as if it were solo scriptura—as if the reformers endorsed the private interpretation of Scripture, which they clearly didn’t—Gregory lumps the reformers’ views together with those of the radical Anabaptists. The results were obvious: religious wars and skepticism among European elites regarding all doctrinal claims. So they turned instead to a secular reason that extinguished God’s presence in our world and in our knowledge of it. Armed with the metaphysical-univocity-thesis, each chapter traces the same path from the Reformation to Descartes, Newton, Spinoza, Locke, Hume, Kant, Hegel, Schleiermacher, Nietzsche, Husserl, and Heidegger. Even when the bad actor is actually Roman Catholic, it’s somehow because he’s following a Protestant script. I share Gregory’s worries about the idea—and impact—of univocal metaphysics. But even de Lubac’s account (of how it went wrong) includes other important events long before the Reformation and even before Scotus. Gregory is certainly correct to underscore the significance of church controversy for encouraging skepticism; but that had already happened repeatedly—as recently as the Western Schism (1378–1417) when for more than a half-century the church was divided between rival popes. Everyone in Christendom was under the excommunication of one pope or another. How could one be sure of being obedient to the church’s real leader and therefore truly in a state of grace? The schism itself was provoked by a debate over whether pope or councils had the ultimate authority in the church, much less the state. Gregory exaggerates the medieval consensus. Mystical schemes bordering on pantheism vied for recognition alongside debates over the eternity of matter. What about the condemnations of Aristotle (and, by implication, theologians like Aquinas who appealed to him) by the University of Paris and the Vatican, before they reversed their position? And what about the influence of the Renaissance in reviving pagan magic and in releasing perpetual torrents of new translations of ancient skepticism, Epicureanism, and Stoicism into the early modern bloodstream? None of this appears in Gregory’s monochromatic account. And was the violent reaction of a thoroughly corrupt papal curia, leading to widespread bloodshed, somehow the fault of the reformers who still managed to stir up the courage to attend conferences to find any possible common ground? I’m on the side of those who still value the history of ideas. But The Unintended Reformation gives intellectual history a bad name. There were apparently no social, technological, economic, or political factors at all—these are all effects rather than causes. And it’s just a few ideas that hail from Scotus mediated by the reformers to Nietzsche. Where the central assertions in the book aren’t erroneous, they’re often trivial. Does anyone disagree that the 16th–century Reformation and Counter-Reformation divided the Western church? Or that the competing truth claims generated greater rivalry, followed by revulsion as armies leveled cities in the name of Christ, opening the door to greater state control and the limiting of doctrine to the private sphere? While “unintended consequences” is an illuminating category, in Gregory’s telling it becomes a catch-all for nearly anything readers of Alasdair MacIntyre’s After Virtue find the most lamentable features of our age. Was the Reformation the unintended consequence of a corrupt medieval church? What are the unintended consequences of the Counter-Reformation? The French Revolution? There’s an ironic similarity between polemical treatises like The Unintended Reformation and myriad Protestant works. Both turn a complicated 16th century into a simple (and anachronistic) narrative orbiting around central ideas like “scientific imagination,” “democracy,” and “capitalism” and then either praise or blame the Reformation for its pioneering role. Aside from jaundiced history, what’s lost is an accurate picture of the metaphysical assumptions of the reformers themselves and particularly their successors—the Protestant scholastics—who were remarkably traditional and even Thomistic on several of the points in question. If one takes the view of many historians (such as Jean Delumeau or Patrick Collinson) that the Reformation wasn’t only a re-evangelization but even in some respects a “primary evangelization” of a barely Christianized Europe, it’s more difficult to see it as a carrier of modernity, much less secularization. But by itself that would be merely a reverse form of polemical history-writing. What’s missing from all such accounts is a narrative as complicated—and interesting—as the history itself. Michael Horton is the J. Gresham Machen professor of systematic theology and apologetics at Westminster Seminary California. His books include Putting Amazing Back into Grace, Christless Christianity, and The Gospel-Driven Life.